In December, Poland will be hosting the next UN Climate Change conference in Katowice. The choice of Katowice was made to showcase the successful modernization of this old coal region, but it will also highlight the difficulties shared by coal-dependent countries around the world, writes Anna Mikulska of the Kleinmann Center for Energy Policy. Like other countries, such as India and China, Poland is taking steps to reduce coal use, notes Mikulska, but the transition is challenging. Energy security is probably the biggest issue. 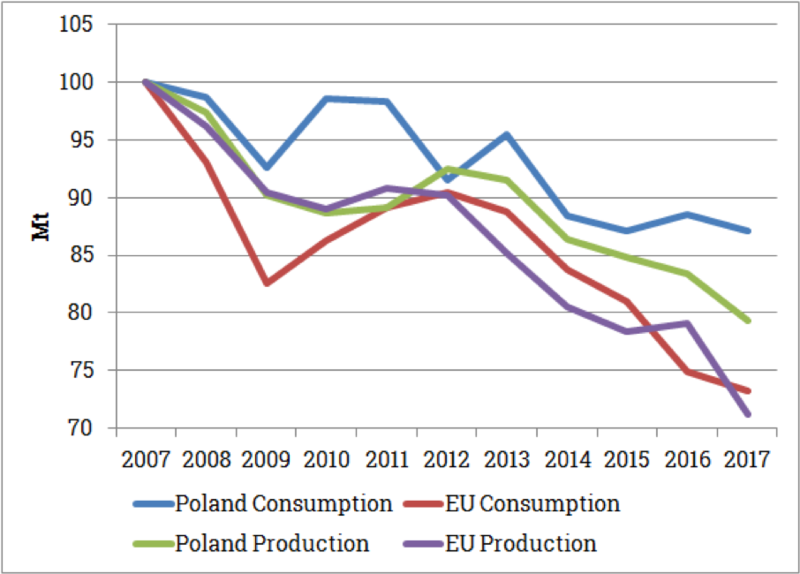 Over recent decades, Poland has dramatically decreased its production and use of coal. However, as impressive as its achievements have been, Poland is still a long way from eliminating coal or drastically reducing its use in the country’s energy mix. There are several reasons for this, including coal’s legacy, socio-political issues and energy security concerns. Importantly, these factors are not unique to Poland. And as the world strives to eradicate CO2 emissions, we should see them emerge as an increasingly important part of the climate change discourse. Poland’s coal production has fallen significantly in recent years (Figure 1). The drop has been most visible in hard-coal production, which amounted to 70 million tonnes in 2016, a far cry from the 150 million tonnes that the sector contributed in 1990 or the record 200 million tonnes it produced in 1970. Lignite production fared better, but still recorded a 13-million-tonne loss in 2016 from the record 73 million tonnes a year produced in the mid-1980s. Consumption of coal has also waned, with 2017 marking a 100-year low for the contribution of coal to electricity production. Nevertheless, coal still makes up approximately 50% of Poland’s energy needs and 80% of its electricity generation. In addition, the drop in coal consumption, in particular, has not kept up with that seen in the EU as a whole. In 2016, Poland accounted for almost 20% of total EU solid-fuel consumption, with the average Pole “consuming” almost three times as much as an average European. Going forward, the government predicts that coal will remain at 50% to 55% of Poland’s total energy mix through to 2030, if not 2050, though it hopes to limit the associated CO2 emissions via variety of mechanisms ranging from CO2 sequestration to coal gasification, and carbon capture and storage. So what keeps this industry alive and relatively well at the heart of an EU increasingly committed to decarbonisation and reducing the use of coal, the most polluting of the fossil fuels? To start: the legacy. In many ways, Poland’s economic and industrial development has been based on domestically available and abundant coal. The typical long lifespans of coal infrastructure make it difficult to abandon the sector all at once. And familiarity with the technology and the presence of an established specialised workforce is still encouraging investment in the restructuring or replacing of some of Poland’s aging mines and coal power plants. Also, even though employment levels in the coal sector have dropped more than fourfold since early 1990s, approximately 100,000 workers still work in the industry. That workforce is concentrated in the hard-coal regions of Silesia, making a quick switch to a different employment structure even more problematic. This geographical concentration of the coal-related workforce has big consequences for Poland’s electoral politics. Of the total 460 seats in the lower chamber of the Polish parliament, 101 are elected from hard-coal areas in Lower Silesia, Opole and Upper Silesia. The highly contested, “swing state” nature of Polish local politics also means that, ahead of elections, it is imperative for all parties to appease the large group of coal-industry workers that are historically well organised in a politically active labour union. As former Prime Minister Ewa Kopacz found out in 2015, they are ready to threaten not only local election results but also the stability of national government. The high level of respect miners enjoy across the nation provides an additional boost to their position in the political discourse. As a result, all Polish governments, independent of which party is in power, have been, and are likely to continue, treading carefully when it comes to coal. But policy considerations with respect to coal go beyond elections to include more substantive issues such as energy security. For Poland, coal is the only energy resource that is domestically abundant, relatively cheap and easy to access. In contrast, a majority of the country’s natural gas, coal’s most serious competitor, is imported. Those gas imports have traditionally been dominated by Russia, a partner that Poland sees as likely to use its energy dominance for geopolitical goals. While Poland is making significant strides to diversify its natural gas supplies, through LNG imports and new pipelines and interconnectors, these are focused on backing away from Russian gas, rather than replacing coal. When it comes to other potential coal substitutes, renewable generation in Poland is in its infancy and unlikely to expand quickly in a significant way, due to the issues of intermittency and the costs associated with infrastructure build up. Costs are also an impediment to the future of nuclear power generation, which has yet to move beyond the decision stage. At the same time, in a nod to the EU’s policy of decarbonisation, Poland points to a set of strategies it has that will potentially limit CO2 emissions and other pollutants associated with coal mining, coal power and heat generation. The use of higher-quality, less-polluting coal. Higher efficiency and lower energy intensity in the country’s economy. The implementation of new, less-polluting coal-power and heat-generation technologies. Potential coal capture and storage options. The government also hopes that future technological advances will repurpose coal, including via gasification and applications in nuclear power generation. In the meantime, however, since many of these strategies are still in their infancy, Poland may be opening itself up to potential fines if it does not follow through on its EU commitments. This could make the production and consumption of coal more expensive, though it is unclear to what extend potential costs would prevail over the considerations mentioned above. On the domestic front, issues related to the evermore bothersome smog associated with coal use will also likely challenge its position. So too will the aging infrastructure and need for continued investment in a sector that is increasingly seen as belonging to the past rather than the future. In December, Poland will be hosting the next Climate Change Conference in Katowice, the heart of its coal country. In the opinion of the organisers, Katowice represents a symbol of a region transformed from being coal dependent to becoming a paragon of modern industry, innovation and culture. The conference is also supposed to highlight Poland’s successes in CO2emissions and climate change. But Poland’s choice of Katowice is also likely to underscore the difficulties shared by coal-dependent countries around the world, including top energy consumers like China and India. As tensions related to international tariffs and potential trade wars mount, the issue of energy security, especially, is likely to gain momentum, with domestically available coal becoming more important not only for developmental purposes, but also as a “safe” or “safer” energy source. Anna Mikulska (@anna_b_mikulska) is Senior Fellow at the Kleinman Center for Energy Policy and Nonresident Fellow at the Baker Institute’s Center for Energy Studies. This article was first published on RiEnergia and is republished here with permission.